Defensive stocks are the first thing most investors turn to when market uncertainty begins to climb. While sectors like utilities, healthcare, and consumer staples may top the list of choices, there’s another industry that can go unnoticed – ‘sin’ stocks. ‘Sin’ stocks are named such due to the nature of their business – generally casinos or alcoholic beverages. These are products or services that remain popular for consumers even during economic downturns. After all, people don’t stop buying alcoholic drinks when the economy is doing poorly – many actually increase their purchases. One ‘sin’ stock has the kind of long term stable growth to weather any economic storm and gives investors a path to higher profits. Diageo plc (DEO) is an $87 billion winery and distilling company best known for brands such as Johnnie Walker, Crown Royal, Smirnoff, and Captain Morgan. Based in Great Britain, its products are sold in more than 180 countries worldwide. One catalyst for investors may come from inside the company. Chairman Javier Ferran purchased $1.3 million worth of stock in late December bringing his total investment for 2018 up to $3.18 million. For investors, a large insider purchase is generally seen as a positive indicator. When management invests their own money into their company, it’s because they expect the stock price to appreciate. The stock trades in line with the industry average at 23 times earnings and appears relatively unimpressive when comparing various other ratios that all fall within the average. But its ability to provide steady returns is what investors should be focused on. One of Diageo’s most attractive qualities is the 2.95% dividend yield it currently offers. The company boosted dividends by 5% last year and with a payout ratio of just over 50%, the company has plenty of room to boost dividends down the road. While the stock itself hasn’t been a fast-growing one, up just 10% in the past 5 years, reinvesting the dividends over the same time period results in a 26% return. The company also boasts a strong buyback program repurchasing more than 2 billion euros ($2.27 billion USD) over the past summer alone. Diageo has traded mostly flat for the past 12 months – down about 2%. But momentum appears to be shifting to a more bullish outlook. 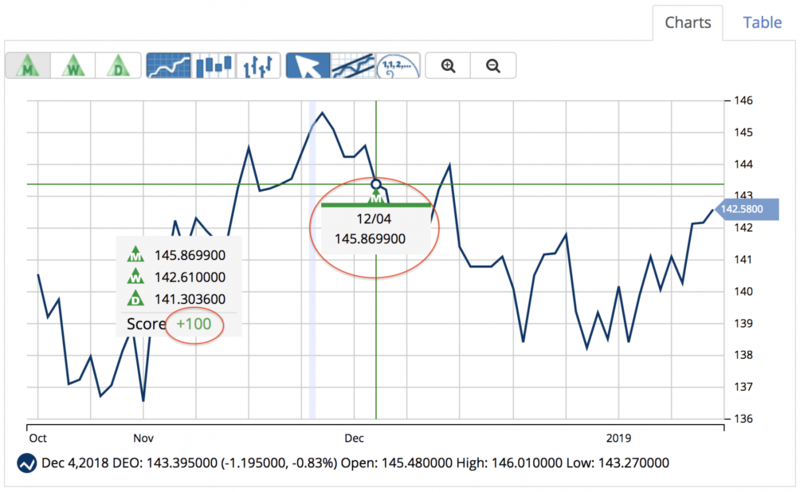 An analysis based off of the Commodity Channel Index (CCI) reveals a strong uptrend with a current readout of 141 – a sign of a new bullish trend emerging. Based on Diageo’s full-year EPS estimates, this stock should be fairly valued at around $158 per share – a gain of more than 11% without considering the dividend yield. Investors looking for a steady dividend-paying stock in an uncertain market should consider adding Diageo to their portfolio. MarketClub is in agreement with Mr. Cross’s analysis. The short-term, intermediate-term, and long-term trends are all suggesting that an uptrend is in place and that this market will likely remain in a long-term positive direction. In fact, the last Monthly Trade Triangle was issued on 12/4/18 with a confirming Weekly Trade Triangle issued late last week on 1/18/19 at $142.61. DEO is rated at a +100 by our Smart Scan Technology – learn more. Members, you can add DEO to your watchlist and set your alert so you’ll know the second our technology detects any weakness in the trend for this stock. Not a member? 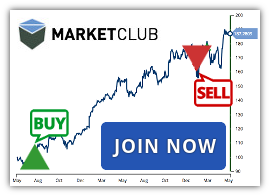 Get exclusive analysis and signals for DEO when you try MarketClub for 30 days.